What is the strangest food for me? I think Thai curry and pineapples in Subuta are strange food for me. I cannot choose which is the strangest. First, I will write about Thai curry. When I went to Thai Taste, I ate it. It was my first time to eat it. Japan also has curry and rice, and it is my favorite food. Therefore, I was excited when I ordered curry there. However, the appearance was different. It looked like India one. Japanese one has carrots, potatoes, and meat in it, but Thai one has some vegetables, tofu, and herbs. The taste was completely different. It was much worse than I had expected. It tasted like strange soup, and I thought it was not curry. Although the taste was not good, t was good for me because I could try curry of other country. Second, pineapples in Subuta are also strange for me. 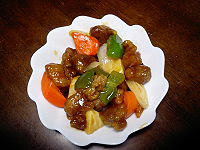 Subuta is Chinese food, and it is fried pork and vegetables seasoned vinegar, sugar, and soy sauce. When I was an elementary school student, I ate pineapples in Subuta for school lunch. They were very strange, because they were hot even though they are fruits; therefore, I thought they should not have been hot. I could not accept them at all. I will never try them again. I'm not a fan of Pineapple's either. My father and sister love them. They even drink the pineapple juice!